I'm excited to share a book with your from Brian Houston of Hillsong. Live Love Lead: Your Best is Yet to come is his latest project. In this book Houston shares a lot of background on how he came to be in this successful ministry. He comes across as a very humble man in the book constantly reminding us that it was not really anything special he did but what God has done through him being a willing servant. I found that refreshing. This was a very uplifting book which I found inspiring. How do people experience the best life that God intends for them? The answer lies in understanding that the Christian life is an adventure, and that they only have to follow the greatest Guide who ever walked the path of life--Jesus. 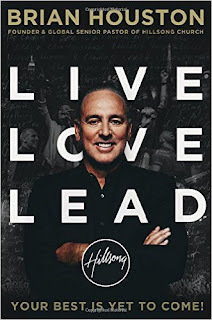 In this straightforward book, Brian Houston shows readers the way to live fully, love completely, and lead boldly--the hallmarks of Jesus' time on earth.